To the climbers and moutain hikers of Europe, the name Romsdal is familiar. The Romsdal region on Norway's west coast is located near the small fjord town of Andelsnes, and is famous for its steep mountains, deep valleys, and spectacular beauty. In summer, the area is often sieged by wet Altlantic coast weather, and incredible waterfalls cascade down the awe-inspiring granite walls. When it clears, the area shines spectacularly in this beautiful mountain area. In winter, the sun only shines a few hours a day and temperatures drop well below zero, and the waterfalls freeze into 2000 foot columns of ice, only a few of which have been climbed. Many fine summer rock climbs have been established on every major peak in the area, many of which resemble the Matterhorn in striking outline. One of Romsdal's rock faces in particular catches every climber's eye: The Troll Wall, a huge cliff which rises vertically for over 3500 feet. The rock is gneiss and bears little resemblance to the solid granite of Yosemite. The Troll wall sees only a little morning sun; even in summer, ice fills the cracks on this north facing wall. The rock is featured, but generally not solid, and continual rockfall is the norm. Snow and ice on ledges and features melt on the warmer days increasing rockfall and necessitate climbing sections of wet rock on most routes. Routefinding is a major challenge on most routes, as is the weather: the storms that move in frequently all year around are serious: drizzle turns to sleet, and falling ice and slippery conditions cause serious objective hazards. 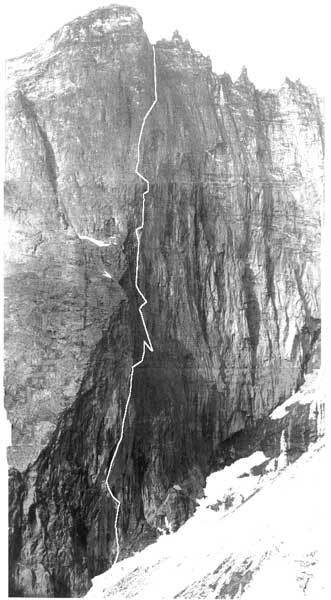 In the 1960's and 1970's, as Yosemite's great walls were being climbed, similar feats of big wall endurance were being performed on an arena quite removed from the temperate California scene, on the 1100 meter Trollrygen (Troll Wall), Norway's monster north facing big wall. At first sight, the wall seems just another buttress of rock along a high and majestic granite canyon. Then the "trolls" are spotted: a unique series of spires and pinnacles formed along the summit rim of the Trollrygen. Legend varies, but possibly the trolls that once inhabited this coastal mountain region (and still part of area's lore), were petrified forever for their sins. Each of the dozen- or-so 300 foot spires has its own name, such as Trollkjerringa, which translates directly to "Troll's wife", but locally conjures up an image of a troll hag armed with evil spells and potions. After a moment, the size of the shadowed wall below the formations becomes evident: huge corners, concave roofs, and crack systems appear in the broken and foreboding rock face, which, if you happen to be a big route climber, is soon followed by a self-destructive impulse to approach the wall and thrust oneself onto the vertical. In July 1965, a Norwegian and a British team simultaneously approached the base of the mighty Troll, a short 2 hour hike up the talus from the road. The attraction of this magnificent wall to the climbers of the day was the problems of finding a route up the massive wall, rather than the intrinsic pleasure of climbing the rock. Four Norwegians pioneered a route up an obvious corner and gulley system on the left side of the wall. They spent 11 days on a historic climb which has seen only a few repeats and is known as being "more dangerous than difficult", due to the loose and dnagerous rock encountered in the gulley. Much of their difficulties arose from the soft iron pitons of the day which were difficlut to remove, and the strong Norwegian ethic about clean passage in the mountains, which meant that no equipment could be left fixed. The strong Norwegian ethic of keeping their environment pristine frowns strongly to this day to climbing litter, like fixed ropes left behind after aborted attempts. The team of three English climbers decided to take a more direct line up the center of the face. After a masterpiece of route-finding up dubious crack-lines, traversing blindly around columns of loose rock, and climbing long steep walls capped by imposing overhangs, much of which at the highest free and aid standard of the day, they reached the top in 5 days of continuous climbing. It was a great day for the Rimmond Mountaineering Club. The Rimmond route, as it is now known, has become the most popular route on the wall and is routinely climbed in a day. In 1967 a French team climbed a beautiful directissma up the center of the steepest section of the cliff. The team spent 21 days fixing ropes to within 600 feet of the summit, then continued to the top in a single push. In 1971 the route received a second ascent by a determined British team in 8 days of bad weather. During this period the wall (and especially the French Directissma) had seen many attempts but few successes. In 1972, eschewing the problems with fixed ropes, the poet-climber Ed Drummond teamed up with his friend Hugh Drummond (no relation) and took on the obvious remaining challenge: to establish a new route on the steepest part of the wall without recourse to siege climbing. Their epic climb is truly a testament to human perseverance. With only 12 days of rations, the Drummondteam were slowed by violent storms that pinned them for days at a time in their frail hammocks or on tiny stances. After 20 days of difficult climbing, the pair topped out in a very exhausted condition, having had no food or water for the last three days on the wall. They named their route, "The Arch Wall". Since these historic days, 6 more routes have been added to the Troll, several of which present a challenge to the big wall climber. The potential for modern aid lines is relatively untapped: all ten of the established routes follow major crack lines, yet many new routes with minimal bolting look possible using advanced aid techniques. Copperheads are relatively unheard of in Norway. Several routes go at a high free-climbing standard: eliminating the aid on established routes by free climbing bold sections of difficult rock has been a current trend and is likely to continue on the Troll. The other current trend is to climb the established routes in winter. Winter conditions on the Troll are extreme and compete for severity with the most remote mountain ranges of the world. VI, 5.10, A3. 3 or 4 ascents. 1200 meters. First ascent in 1965 by Leif Pettersen, Odd Eliassen, John Teigland, and Ole Enersen. Winter attempts, but no ascents. In winter conditions this is a hideously difficult mixed (ice and big-wall) route. VI, 5.10, A4. 5 or 6 ascents. 1100 meters. First ascent in 1967 by Yves Boussard, Jerome Brunet, Patrick Cordier, Claude Deck and Jean Frehel. First winter ascent (Polish) in 1974 by W. Kurtyka, M. Kesiki, R. Kwalewski, and T. Piotrowski. A long classic directissma. Portaledge and aid climbing gear a necessity. The route has gone largely free, but the roofs at 2/3 height present a difficulty. Direct finish added by Polish team in 1973 in winter. VI, 5.11-, A4+. 3 or 4 ascents. 1100 meters. First ascent in 1972 by Ed Drummond and Hugh Drummond. This 3,500 foot route received its first winter ascent in 1994 by a strong Polish team consisting of J. Fluder, S. Piecuch, and J. Golab. Second ascentionist Aslak Aastorp (who climbed it with American expatriate and big wall ace Tom Cosgriff who now lives in Oslo) reports, "a portaledge is a great advantage on this route. Eight to twelve climbing days with a lot of skyhooking. A free ascent is thinkable but will require a lot of cleaning and a very bold climber, otherwise you would have to 'bolt to death' one of Norway's finest and most historical aid-climbs." VI, 5.11, A3. 1 ascent. 1000 meters. FA 1985 by O. Vadla, L. Magnusen. A first ascent in impeccable style. Two climbers running up a new line during 2 days of almost nonstop climbing (the were worried about a bad weather forecast). The route is mostly free with a few aid pitches. The first pitches are always wet, but the line looks excellent. Two or three days with free climbing equipment. V, 5.11- Many ascents. 1000 meters. First ascent by a L.G. Johansson, T. Hilsson in June,1978. First Free ascent by Hans Christian Doseth, H. Nesheim, and K Svanemyr. First Winter ascent by HC Doseth, C. Brooks, and S. Bancroft in1980. The Swedish route is one of the two classics on the wall. Lots of bivouac sites,. Average time: 2 days, but has been done in 13 hours.
. VI, 5.10, A3. 1 ascent. 1000 meters. First ascent by P. Xavier Porta, J. Grau, and JC Castevelli (Spanish) in June1986 during a 14 day period on the wall. This big-wall route is now considered a variation of both Raspberry Dream and the Swedish routes. VI, 5.12- 3 ascents. 1000 meters. First ascent by Japanese climbers in July1986. First winter ascent by A. Aastorp and O Vadla in 1987. First free ascent by Aslak Aastorp, Oyvind Vadla, and K Klementsen in 1987. What is now called Raspberry Dream is a free route that combines most of the original Raspberry Dream line and includes sections from both the Rimmond Route and the Sleepwalkers route. Rockfall in 1991 may have affected the route. Has been climbed in 3 days with a free climbing rack and no big wall gear. V, 5.10+ Many ascents. 950 meters. FA 1965 A. Howard, J. Amatt, B. Tweedale. First winter ascent in 1976 by a Czech team of M. Smid, V Sirl, J Janis, J Raconcaj and P Plachecky. First free ascent by Hans Christian Doseth and Ragnild Amundsen in 1979. First solo ascent in 1982 by B Ostigard. The Rimmond is the classic of the Troll, and has been done in as fast as 8- 1/2 hours. It is the only route on Troll that has seen roped-solo ascents (several), including the first female solo ascent in summer 1994 by Anne Grete Nebell (who has also climbed several other routes on the Troll). VI, 5.11 2 ascents. 800 meters. FA Winter 1982 by Hans Christian Doseth, Choe Brooks, Havard and Sjur Nesheim. First free ascent (2nd ascent) Summer 1982 by HC Doseth and Masakuzu Fujiwara (Japanese climber who seconded the whole route). Hans Christian Doseth, who died on the Great Trango Tower in 1984, was a visionary Norwegian climber climbed many routes on the Troll and was legendary for his big wall and bold free climbs. This serious route is a great independent dihedral line which does not intersect any other route. Plan for 3 or 4 days with free climbing rack and possibly a portaledge. Route is rumored to be sustained, poorly protected, and understated by its given grade. Dod At Alla/Prektige Blonde Vikinger (Death to All/Pretty Blond Vikings). VI, 5.11, A4. 600 meters (plus 400 meter approach ramp). First and only ascent in 10 days in winter 1986 by Aslak Aastorp, Oyvind Vadla, Bernt Pedersen, and Oystein Bardsnes. The first ascentionists did not have to place a single bolt on this magnificent overhanging crack and corner system on the right margin of the wall. The difficult approach to this route up a1500 foot ramp system is perhaps easier in winter, as it has caused a few failed attempts to repeat the route in summer. The first half of this route goes up thin aid cracks in clean compact granite (similar to the right side of El Cap), while the latter half continues up steep free climbing cracks. Tops out at the Bruraskaret Col, one of the spots where the BASE jumpers launch from. NOTE: In the small nearby town of Andalsnes, where all the town folks are familiar with the routes and climbers of the Troll, "Dod at Alla" has been renamed "The Cathedral" for tourist industry reasons. "Prektige" is difficult to translate (the direct translation means "excellent"), but infers a goody two-shoes meaning. The weather can be fine anytime from the middle of June to the beginning of October, but the best weather months are generally in July or August. The weather comes in directly from the coast a few miles away, and a general drizzle pushed in by the warm and wet Gulf Stream winds is prevalent in the summer, yet most climbs are endured in such conditions. Generally, the wall needs several days of good weather after a storm to clear snow from the face before conditions are optimal. Similar to El Cap in Yosemite, the gear depends on the route. The fast routes (the Rimmond Route and the Swedish Route being the most popular) are climbed "Nose-in-a-day" style: carrying only a light pack and free climbing gear. The more involved routes (like the Arch Wall) require the full big-wall rack, portaledge, 10-12 days of food and water, stove, bivy gear, etc. Andalsnes is in the center of the mountainous region of Romsdal, home of the Troll. Trains from Oslo, the capital of Norway, can be linked to Andalsnes, which is only a few miles form the Troll wall and many other climbing and sport climbing areas. Before planning any trip to the area, contact the AAK Fjellsportsenter, the hub of outdoor activity for the area which offers everything for the outdoor adventurer, including information about all the activities in Romsdal and lessons in climbing, telemarking and ice climbing. AAK offers lodging at about $13 a night in a hospitable hut with all the amenities and a nice climbing library too. Mary Nord, the proprietor of the hostel, speaks English and offers excellent Norwegian cuisine for the guests at a reasonable price. AAK Mountain Center offers information about how to get discounts of 30% off train travel from Oslo to Andalsnes. There are also several huts in the mountains which require hiking to. Andalsnes is a small town with several markets, but for major food and provision purchases, it is better to buy in Oslo, where prices are less. Walks and Climbs in Romsdal Norway, Tony Howard (1970, Cicerone Press). Phone: (011-47) 22 56 40 43 Climber and Oslo bartender who can show you the hippest bars of Oslo in what must be one of the wildest nightlife scenes in the world. He can also supply information about the Oslo climbing scene. Find him at the Barock on Universitet street.